A seven-building office complex in Blue Bell has come on the market and one estimate has it selling for upwards of $100 million. Rebranded as Veva, many people know the property by it former name, Sentry Park. The complex totals 420,546 square feet and comprised of two buildings at 1787 Sentry Parkway West called Veva 16 and Veva 18 and 1777 Sentry Parkway West, which has Veva 11, 12, 14, 15 and 17. 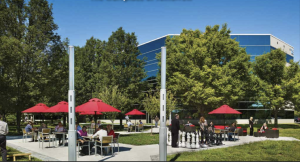 The buildings combined are 96 percent leased with such tenants as USI Insurance, IBM, Toll Brothers Inc. and Jean Madeline Inc.
Keystone Property Group is the seller and last year began to to unload some of its office buildings. In July 2018, the Conshohocken real estate company selected nine of its suburban properties -— including a separate three building complex in Blue Bell — to sell as some of its funds used to buy the properties wind down. The company has also turned some of its focus on its biggest and first out-of-the-ground development, Sora West. That $300 million development involves a new 427,333-square-foot headquarters for AmerisourceBergen in Conshohocken. A representative from Keystone couldn’t be reached for comment on Veva. In 2013, Keystone bought Veva 16 and Veva 18 as part of an acquisition of a portfolio that Mack-Cali Realty Corp. was selling at the time. Keystone already had a presence in Blue Bell and the buildings fit within its existing portfolio. Keystone initiated a round of upgrades at the buildings, investing millions of dollars to put in a fitness facility, café and lounge, a conference center and outdoor patio area. It also rebranded the properties as Veva to present them as a more cohesive campus and differentiate them from other office buildings in the immediate area using Sentry Park as part of their name. As a leading Blue Bell Pennsylvania commercial real estate broker, the team of real estate professionals at Wolf Commercial Real Estate helps owners sell and/or lease their office space in Blue Bell Pennsylvania through a defined marketing process that we tailor to each property. This proven marketing strategy successfully matches buyers and tenants with available Blue Bell Pennsylvania office space. For companies and individuals seeking new office space in Blue Bell Pennsylvania, the knowledgeable team at our Blue Bell Pennsylvania commercial real estate brokerage firm are experts in identifying the Blue Bell Pennsylvania office space that best suits your needs. Our Blue Bell Pennsylvania commercial real estate team will ensure that the sale or lease terms for your new office space in Blue Bell Pennsylvania fit your commercial real estate goals. For more information about Blue Bell Pennsylvania office space for sale or lease, please contact the team at Wolf Commercial Real Estate, a leading Blue Bell Pennsylvania commercial real estate broker at 215-799-6900.